We featured this article several months ago, but we are reprising it because so many people are getting fooled by scams similar to the one we describe in this article. We don’t want it to happen to you. Knowledge is power and knowing what to do if scammers try to trick you can save you a lot of misery and trouble. We work on dozens of PCs each week, and we can tell you from personal experience there are a lot of people getting scammed every day – and not just for a couple of bucks – but for hundreds of dollars. Sometimes we tend to think people get a little careless on the internet at times, and we’re sure they do – all of us do. Recently we got a taste of what a lot of these poor folks who get scammed out of hundreds of dollars run into on the web. And it’s not pretty and it can be scary – unless you know what to do. This morning, I (TC) was going to a site I visit quite often when suddenly I noticed a horrid beeping coming from my laptop speakers – the dire beeping of a dying hard drive, a terribly sick PC or some other unseen and unknown computer malady, were my first thoughts. This kind of sleazeball scam with all these dire warnings, awful computer noises, and a browser that you can’t easily close, is a scam designed to scare those are no computer savvy. When they panic, they don’t think, and they call the toll-free number. Notice above, that my real Internet Service Provider (ISP) and my real IP address are displayed. I imagine causes panic in those who don’t know that every browser broadcasts your IP address, location, your ISP (and a lot more information about you). If you don’t believe me, just visit http://www.whatsmyip.org/ and see how much data your browser broadcasts about you. Will all this info being broadcast from your browser constantly, it’s really easy for these scammers to tap into that info stream and make these scams look personal – and that’s easy to do since they do have your ISP, your IP address, your operating system and the name of the browser you are using. It’s all very convincing and it’s all used to trick you into falling for a scam. Despite their efforts to make it seem very personal by showing you that they know your IP address, browser & operating system, and the name of your ISP, you’ll notice they don’t say “Dear TC”, “Dear Charles”, “Dear Sally”, etc., they just say “Dear Time Warner Cable Internet Llc Customer”. They misspelled LLC as Llc as well. “Dear customer” is almost always a dead giveaway that something is not right. And sure enough, when you try to close your browser, you can’t close it. Instead you hear more awful grating beeping sounds. All this is, of course, intended to alarm you , make you stop thinking and panic, then get to you to call some slimeball company’s toll-free number. And… if you do call, they’ll set you up – really set you up. When you call their toll-free number, they will set you up to connect to them so they can “analyze” and “fix” your computer. And of course, they’ll run fake scans on your computer showing a litany of fake malware and viruses they will claim are destroying your data and your PC. They’ll show you hundreds, sometimes thousands, of fake files that they will say are infecting your computer – and for just $99 or $199, or even $299 – they can clean all this bad stuff off, fix your computer, protect your identity and save your computer from a terrible fate. And sadly, many people, pay the slimeballs. We have known people who have paid up to $500 these scumbags (fortunately, we we able to help them get their money back). Microsoft nor any other legitimate computer repair company is ever going to show you a warning like the one above – not now, not tomorrow, NOT EVER. 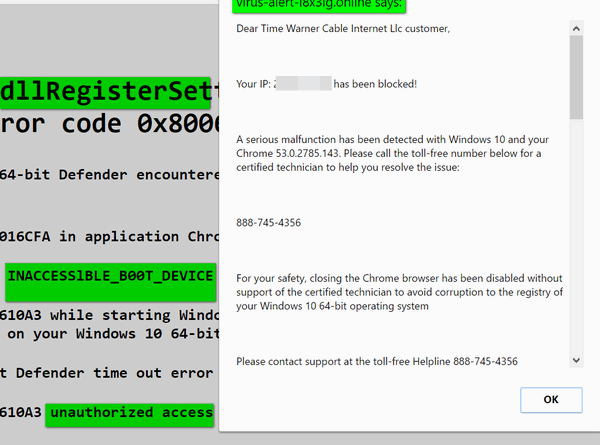 If you see a popup like that, that tells you your computer is infected or has serious errors or both and/or asks you to call a toll-free number. DO NOT DO IT. a.) Press the ALT key plus F4. I pressed ALT + F4 twice. b.) Press Ctrl+Shift+Esc and open task manager. 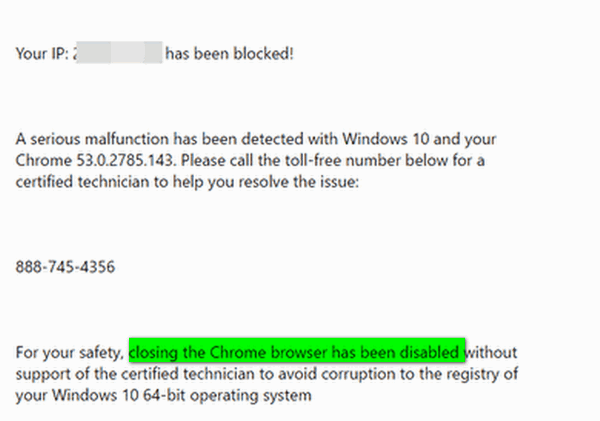 Right-click on each instance of your browser that you see and choose “End task” – disregard the Windows warning about losing data, etc. c.) Press & hold down the Windows key and tap the R key. In the Run box which appears type SHUTDOWN /R – this will restart your computer. You may see a warning that certain programs are open and need to close before you restart – do not click Cancel. Let Windows close all programs and reboot. d.) If nothing else works, completely power off your computer using the power switch, and leave it off for a couple of minutes. then turn your computer back on. e.) As one of our readers (Margie) pointed out .. “when you do restart your computer and / or restart your browser, the browser may tell you that your last browsing session closed unexpectedly and ask you if you want to reopen the tabs that were open at the time the browser shut down. Always say “no” because if you say yes, you may well find yourself right back to where you were – smack dab in midst of scam alerts ads, and you’ll have to close your browser and/or restart your computer again. Tech support scams are everywhere. No anti-malware or antivirus can stop you from picking up the phone and calling a toll-free number. But you can protect yourself. Never panic. When people panic, sometimes they don’t think clearly. And remember that these scumbags are smart… but you are smarter. Think ahead. Be prepared for something like this, so if this happens to you, you’re ready for it, and you know exactly what to do. Always use common sense. NEVER EVER call a toll-free number which appears suddenly while your browsing the web. Never give these slimeballs your credit card number. Never give them access to your computer by allowing them to connect remotely. Look carefully at the pictures shown above and familiarize yourself with them. Most online tech support scams use similar tactics. Then follow the tips in this article, and you’ll know how to get yourself out of a situation like this if it ever happens to you. Please don’t let these criminals steal your money, harm your computer, or threaten your privacy. We hope this helps you to avoid falling for one of these scams. One caveat to your totally correct and great information, when you do get your computer restarted your browser may ask if you want to resume where you left off, etc. Always say “no” because if you do, it takes you right back to that same sleazeball site….and you get to start all over with the bells, whistles and warnings. EXCELLENT ADVICE! I’ve added it to the article. Thanks so much! Thanks for the helpful info on how to exit the situation. Can I ask how u stop it happening again when u next visit that site which u use quite often? Also, did your Emisoft installation offer any warning/solution? Hi Ellie, Emsisoft cannot protect you from falling for a scam – neither can anything else. Ad blockers don’t always block these kinds of scammy alert ads. If you are constantly getting these kinds of ads on a site you visit regularly, I suggest you write the site’s owners and complain. It’s quite possible they are not aware of this. It’s possible they are running network ads from some ad network that condones such advertising. In any case, there is nothing you can do, but use caution, if the site decides this is the kinds of ads they want to run. Well aware now of what to do tnx to u guys! Just after this email came out the last time, we were sitting in Palm Springs enjoying a winter away from home when that same message came up on my laptop computer. It does give you a sinking feeling in your stomach, but luckily for me just two days prior to this happening to me, I had received my daily newsletter from you fine folks and I did not panic. I remembered to hit the Alt key and the F4 key and I was out. Just as a precaution I also unplugged my laptop and waited a good 5 minutes before firing it up again. This lap top was going to be a gift to my son when we got back home, so I am so glad for you and your warnings to us. Thanks for saving the day and I hope this being sent out again helps someone else out of that situation. THANK YOU, this helps a lot! !